1. 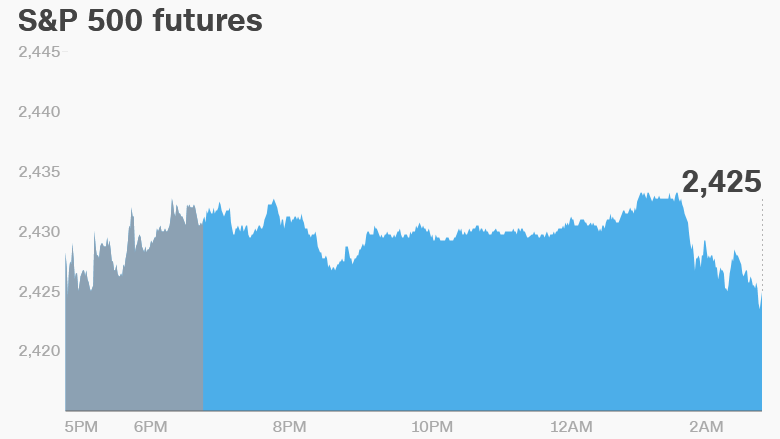 Markets rattled by North Korea: Global stock markets dropped Tuesday after North Korea fired a missile over Japan. The closely watched VIX (VIX) volatility index spiked by 24% and U.S. stock futures were off by between 0.6% and 1%. In Asia, South Korea's benchmark Kospi index closed 0.2% lower, after falling as much as 1% in morning trading. Japan's Nikkei sank 0.5%. Markets in Europe opened sharply lower. Stocks in London and Paris slumped 1.4% while Frankfurt's DAX shed 1.7%. Investors flocked to perceived safe havens. Gold added 1.2%, while the Japanese yen and Swiss franc gained over 0.8% against the dollar. 2. Harvey chaos: Harvey caused more havoc in Texas overnight, with forecasters saying a reprieve won't arrive until week's end at the earliest. An ExxonMobil (XOM) oil refinery near Houston was damaged by the remnants of the hurricane, and the company warned chemicals could be released. Still, the scale of damage Harvey will bring is far from clear. AIR Worldwide, a risk modeling company, estimated Monday that insured losses from just the winds and storm surge could reach more than $2.3 billion. An earlier estimate from the analytics firm CoreLogic showed that Harvey could cause as much as $40 billion total in damage. America's Corporate giants are making big contributions to disaster relief organizations to help victims the storm. 3. Monday market recap: The Dow Jones industrial average closed flat on Monday, while the S&P 500 added 0.1% and the Nasdaq gained 0.3%. 4. Earnings and economics: Best Buy (BBY) is set to report earnings before the open on Tuesday. The retailer's stock is up 46% this year despite intense competition from Amazon (AMZN). Sales for the quarter are expected to clock in at $8.7 billion. A report on U.S. consumer confidence will be released at 10 a.m. ET. In Germany, consumers are feeling great ahead of next month's general election. Forecasts published Tuesday by market research company GfK showed consumer climate is set to reach a 16-year high in September. Data showed the French economy grew 0.5% over the previous quarter in the three months ended June. That's in line with expectations.